This home project feels like it’s been taking us forever, in reality it really hasn’t. But because it was on our “list to do” since finishing our bedroom it feels over due. 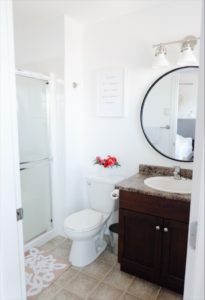 Either way with our hectic schedules we managed to do a little something just to freshen it up a little bit and have it flow nicely with our master bedroom. 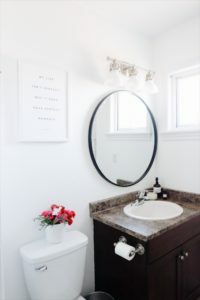 Our hearts are longing to re-do the floors and vanity but with our rookie moves we’ll slowly start to learn the process there and eventually change those up to. In all honesty though this room was just fine with a good old fashioned paint change. A colour change can make such a huge difference just a little bit of paint. We went with white because we felt the room was so small that it opened the space up nicely and it just rolled with the colour in our bedroom as well. 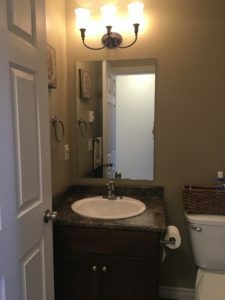 We took a few pieces that we knew we could change on our own and switched those out including a new toilet, shower head, mirror and vanity light. 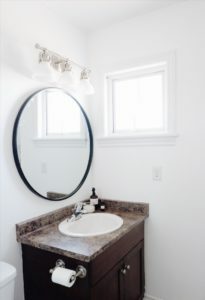 All thanks to Lamps Plus for helping us out with the two, black round vanity mirror and vanity light! It was a lot of trial and error and a lot of youtube videos but Drew and I managed to get it done. 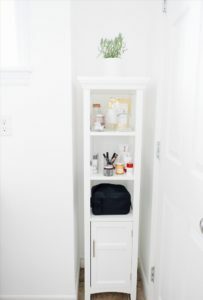 For anyone newbies with home renos you will know exactly how we’re feeling here! This is our first home and our first attempt at home renovations so for that I’m proud of what we’ve done so far together! Disclosure | Please note that sponsored posts are only accepted when they align well with our current lifestyle. All views and options are always my own. Wow! It looked nice before, but it looks GREAT now! The room is so much lighter and more open now! 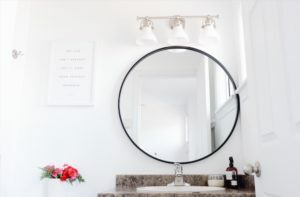 And the cool thing is that you can pretty much add or change colors whenever you want to by just doing small things like using the flowers you’ve got on the back of the toilet. Looks great! I’m sure it makes shower time so much nicer! Beautiful! I think it looks totally amazing. It is very clean and minimalistic looking. 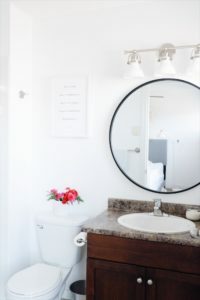 Lighting is definitely something that helps out with a bathroom’s look for sure.